Just B Au Naturel's Balancing Beauty Oil is a fast-absorbing daily moisturizer that balances excessive oiliness and strengthens the skin's defenses against daily aggressors. While it may seem counter-intuitive to use an oil to treat oily skin, that is exactly what this oil should be used for. The last thing you want to do with oily skin is dry it out. In fact, that oiliness is a reaction of skin that is too dry. 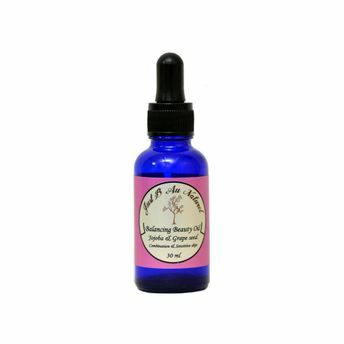 This facial serum balances oily, blemished skin and with regular use sends a signal to the skin to reduce oil production. Carefully formulated blend of plant oils like Organic Golden Jojoba Seed Oil, which mimics the skin's natural texture (sebum) because of its special chemical-molecular composition, Jojoba oil is non-comedogenic and penetrates the skin pores without clogging them, thus allowing the skin to breath freely while at the same time rejuvenating itself with the oil's moisturizing effect. Grapeseed Oil can actually help regulate your natural oil production and is packed with antioxidants, including skin-brightening vitamin C. Grape seed oil is light to touch and never leaves skin feeling heavy with oil. Instead, it effectively moisturizes the skin, balancing both dry and oily patches.